We will make every effort to ensure that MCH employees understand that they contribute directly to the growth and success of the hospital as well as the quality of life for many people. The Millcreek Community Hospital Human Resources Department is a service department that facilitates the entire Human Resources function in order to meet the needs of the hospital as well as its employees and customers. Our goal is to create a work environment that enhances employee recruitment and retention. In our vision the Human Resources team will take pride in what we do and in our accomplishments. We will make every effort to ensure that MCH employees understand that they contribute directly to the growth and success of the hospital as well as the quality of life for many people. We, the employees, management and board of Millcreek Community Hospital are proud of the friendly environment and family atmosphere that make working here a pleasure. As a result, few employees tend to leave MCH, But new opportunities are created through our growth and expansion. If you strongly believe in respect, care, quality and joy in the workplace, and for our patients, their families, and the community we serve, we encourage you to investigate a career at our hospital and enhance your opportunities for personal and professional growth. We look forward to hearing from you. The hospital has Highmark Health Insurance available to all regular full-time employees. The employee is eligible the first of the month following 30 days. The hospital pays a portion of the cost. After 5 years of service, the cost to the employee is further reduced. Part-time employees are eligible to join the plan, being responsible for the entire cost. The advantage of belonging to a group plan is that benefits are available at a lower or comparable monthly premium. The hospital has BAI Dental Insurance available to all regular full-time employees. The employee is eligible the first of the month following 30 days. The cost to employees is reduced after 1 year and after 3 years. Employees of MCH and their families will receive 50% off eye exams, glasses and contact lenses from Sterrettania Optical at the Sterrettania Medical Center, 4000 Sterrettania Road. (814) 836-0543. The hospital provides life/AD&D insurance at no cost for each employee working 15 or more hours per week. The life insurance amount equals your annual salary. All employees receive 2 weeks vacation after 1 year of service. Several professional positions will receive 3 weeks vacation after 1 year, e.g. RN’s, managers, etc. We do provide new employees an opportunity to advance vacation early, but he/she must have completed a minimum of 6 months of employment. (Part-time eligibility is 15 or more hours per week and the vacation is pro-rated according to hours worked). Regular full-time employees are eligible for 4 paid personal days per year after 1 year of service. Each full-time employee shall accumulate 6 sick days per year (you will start to accrue your sick time after the completion of the 90 day introductory period). Employees may have prescriptions filled at a reduced cost in the Pharmacy for themselves, spouse and their dependent children. Full and part-time employees may choose to have the charges payroll deducted. Also, over the counter medications are at a reduced cost for employees. MCH belongs to the Erie Federal Credit Union. As a hospital employee, you can join the credit union using your ID badge at any of the various locations throughout Erie. Employees will be granted time while on duty to attend in-service training programs related to their jobs. The Hospital also pays the cost of selected educational programs outside the Hospital. 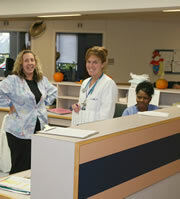 We have an Employee Health Nurse and Emergency Room care is available to all employees as necessary. A cafeteria is provided for employees. Food is served between the hours of 11:30am to 1:00pm and 5:00pm to 6:00pm daily. The Snack Bar is open Monday-Friday 7:00am to 8:00pm and Saturday & Sunday 8:00am to 2:00pm. The Snack Bar is closed on holidays. The vending area is open 24 hours a day. Employees receive free meals in the cafeteria when working weekends and holidays. There are instances when an employee may be absent from work for an extended period of time. Therefore, leaves will be granted with the approval of the Department Head and the Human Resources Manager. Paperwork can be obtained in the Human Resources Office. The hospital will pay employees their regular pay for up to 10 days. Employees subpoenaed for jury duty will sign off their jury duty checks and drop them off in the Human Resources Office. There are designated free parking areas at the hospital for employees. Employees will be paid up to 5 days bereavement pay for the death of a spouse or child. The hospital will pay up to 3 days bereavement pay, up until the day of the funeral, for the death of the employee’s parents or siblings as well as the parents or siblings of the employee’s spouse. Pay checks are distributed to each department every other Friday by 9:00am. Direct Deposit is available to all employees who are interested. Employees receive an extra .20 cents per hour for all hours worked on the evening shift 3:00pm-11:00pm. They receive .30 cents per hour for all hours on the night shift 11:00pm 7:00am. Registered Nurses and Licensed Practical Nurses receive .50 cents for evening shift and $1.10 for night shift where applicable. Tax Sheltered Annuities are available upon hire. If you have worked over 1,000 hours in a year, this is an excellent way to start saving for your retirement and reduces your taxable income due to the amount being deducted prior to taxes being taken out. The hospital will match your contribution at 133 1/3% up to 6% of your salary (up to $230,000 of income) per year, after completing one year of service.